Google Analytics for Firebase is a powerful tool for mobile app development and data analysis. There are many reports that can help you measure the impact of your app on your business. In my previous blog, I listed down some action plans for a gaming app that these reports can devise. 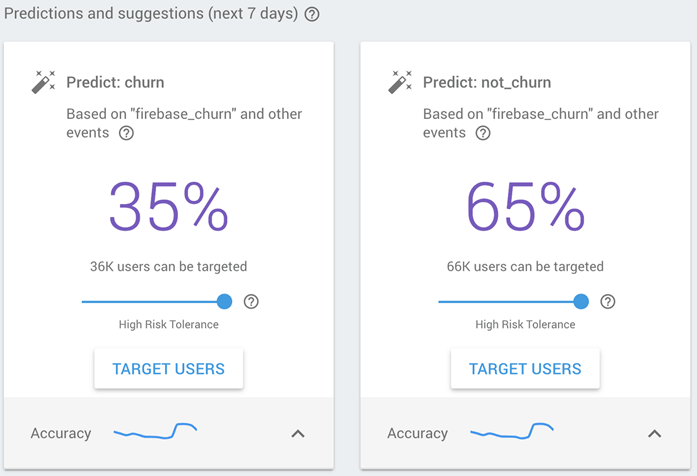 Firebase Analytics defines dynamic user groups based on predicted behavior like ‘churn’ & ‘spend’. It groups all users based on their past behavior (as a single segment) with help of machine learning. It also identifies users with a higher probability of performing certain actions soon. One can predict actions like uninstalling app or buying an app, through Firebase Analytics. You can also set up custom events in Firebase Analytics based on predictive analytics requirements. This action can help you group a set of users predicted to perform that specific event. 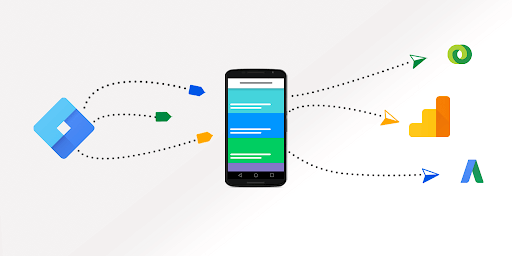 It is possible to leverage Firebase Predictions with other functionalities like A/B testing, Notifications, etc. In the above screenshot, one can target ‘churn’ user segment’ in Firebase to issue notifications to promote user engagement. For example, you can offer free coupons for in-app purchase, or free codes to unlock the next game level. These actions will prevent them from churning at a later stage. Alternatively, you can set up your own prediction segment by grouping users who failed a level more than 5 times, with custom events. Target them through different offers on in-app purchases, to keep them from leaving. You can even set up user predictions who do not interact with notifications. Some users do not expect to get notifications for more than a certain number of times in a day or week. If your push notifications seem too aggressive, it could lead them to churn in future. To retain such users, you can choose this audience with ‘notifications_opened’ user property and pay attention to the same. Group users who do not open notifications for more than 2 times a day and turn their notifications off completely, or reduce their frequency. 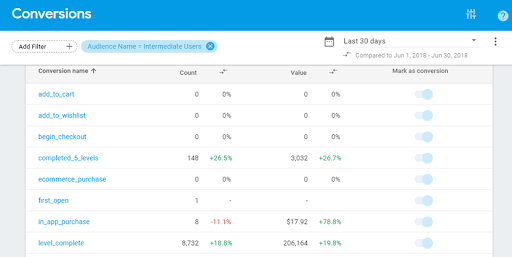 User Property in Firebase Analytics is a powerful feature. It enables you to set attributes at user level and leverage it to create relevant user segments. You can segment users based on gender, location, login status and other dimensions. Moreover, you can also group them based on any specific event or action that they completed. You can further filter users based on their assigned property values by defining them as “Audiences” in Firebase Console. Run personalized campaigns targeted only to them. It is clear that ‘Intermediate Users’ are not keen to make any in-app purchases. They are more inclined towards playing the game for free. Based on this data, you can personalize the app to reduce in-app prices for these users. Check if there is any impact on in-app purchases and conversions with the change. You can even customize app experience based on your users’ categories of interest. For example, you can target tech-savvy users with handy discounts on purchasing gadgets. Encourage them to buy from your app, through ads or notifications. Similarly, you can use these segments to target custom notifications or Cloud Messaging too. Google Analytics for Firebase provides integration with different campaign tools like Google Ads, Google AdMob, and other ad networks. These tools help you run campaigns across any of these networks, without the need to add separate code or additional SDKs inside the app. Import events critical to your business defined as “Conversions” in Firebase Console to Google Ads. Measure them against other campaigns. Use Audiences created inside Firebase Console to target different events or user properties in Google Ads. Show them ads specific to their interest/ behavior. Improve your ARPU (Average Revenue per User) by remarketing users under ‘Purchasers’ segment. Run personalized campaigns and custom landing pages based on their behavior. Check the ‘in_app_purchase’ or ‘ecommerce_purchase’ event details to view campaign performance. Optimize the spending activity too. Consider the following Conversions report of a gaming app. As observed, AppLovin network acquires a lot of users, but they do not prefer in_app_purchase and hence their conversion rate is very low and the LTV (Lifetime Value) is almost negligible. Based on above data, app marketers can stop running campaigns with AppLovin network. Or they can optimize their ad spends focusing on other networks to bring in more conversions and revenue. They can even change AppLovin campaigns and make it specific to ‘New Users’. One can increase spend on Google network by generating creatives specific to ‘Returning Users’. A smart plan focusing on conversions, can lead to many purchases and a higher conversion rate too. Firebase supports export of event logs from Google Analytics for Firebase and Crashlytics to BigQuery. This helps one to perform efficient in-depth analysis of data. 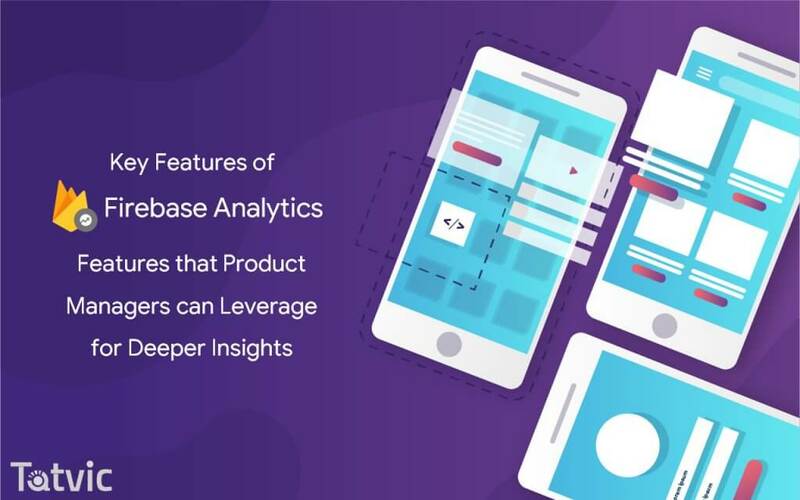 App Marketers can perform end-to-end analysis of app data by importing varied dimensions & metrics from Google Analytics 360, Google Analytics for Firebase, or any third-party analytics tool, to BigQuery. One can combine them to get a single user journey, across different touch-points. Merge app analytics data easily from both mobile platforms (iOS & Android) by running queries on different tables. These tables can be created in BigQuery to compare performance metrics. Export query output from BigQuery data to Google Data Studio. These queries can help build interactive graphs and charts for visualization purposes. Consider the following graph generated in Google Data Studio, by integrating it to BigQuery. The graph collects all Firebase events of a gaming app. It generates reports with event_name dimension and device.operating_system as secondary dimension. 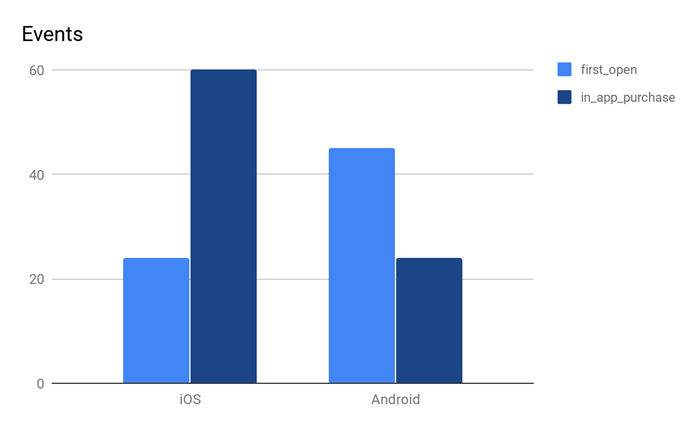 The graph indicates that a higher number of Android users install and use the app, compared to iOS users. But in-app purchases are way higher on iOS devices, compared to Android. One can set up device-specific campaigns for acquisition and conversion. The campaigns can target a specific set of users for promotions or app personalization too. The most important approach towards building an app is to keep updating it as and when required. The process needs to be instant without any hassle of uploading it to the app store again and again. This is where Google Tag Manager comes in handy as it helps developers instantly publish their app changes. There is no need to upload a new version. Marketers can add pixels to the app, without being dependent on developers aided by different marketing tags (Google Ads, AppsFlyer, etc.). One can use the features in Google Tag Manager, without the need to inject pixels inside the app code. If you have implemented Firebase as well as Google Analytics in your app, I recommend that you manage it from a single platform. Organize a common set of events to track on both platforms. Consider a gaming app marketer who wants to launch an event-specific campaign, like Halloween. The marketer wants to promote purchase of gaming merchandise of different characters from the app. There are fixed release cycles for apps in an organization, and not usually consistent with external events. Google Tag Manager can deploy campaign-related tracking data without changes in the backend code. There is no need to release a new version. It is often difficult to manage data and understand trends using various analytical tools. These tools can enhance campaign performance, user behavior analysis and audience targeting. Google Analytics for Firebase helps address this challenge with its vast scope of features and reports. It combines your app user’s behavioral data with campaign performance to build valuable user segments and for future updates. Lastly, one can leverage both analytical tools – Google Analytics 360 for mobile app and Google Analytics for Firebase. A smart Google Tag Manager implementation can help users with analysis and insights. Google tag manager combines two or more data sets and creates different types of generated reports. These reports can help you gain insights from mobile app data. Customer Success Manager at Tatvic Analytics Pvt. Ltd. who is very passionate about her work and is a Google Analytics enthusiast. She likes to read fiction during her leisure time and travel to places with rich historic values. She is also very fond of Music and Dance.